Embodiment in Education™ is an intensive somatic movement education training program developed by Susan Bauer. What is Embodiment in Education? This training introduces educators to a specific curriculum for using somatics with teens and college-level adults. Experiential and student-centered methods presented are based on experiential anatomy and other somatic modalities. This curriculum models a respect for one’s body that empowers students through the development of kinesthetic awareness, enhanced perception of one’s cultural conditioning, and a healthy respect for self and others. We will also dialogue about the complexities of including movement and touch in an educational setting. The program is ideal for practitioners and teachers of dance, yoga, martial arts, or other movement forms, as well dance and occupational therapists, and others who work with young people. Although geared toward professional educators, the workshop is open to all those with an interest in somatics or dance / movement education. Now in its tenth year, this training has been attended by dance professionals from across the U.S and Canada, including from such institutions as Stanford University, Mills College, the University of Michigan, St. Joseph’s Ballet, Spirit Rock Meditation Center, and Stepping Stones Project for Teens. 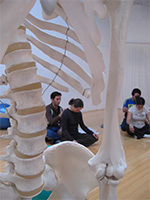 Past guest faculty have included Bonnie Bainbridge Cohen, founder of Body-Mind Centering(R); Deane Juhan, author of Job’s Body: A Handbook for Bodywork; and Caryn McHose, collaborator on BodyStories: A Guide to Experiential Anatomy and co-author of How Life Moves, Explorations in Meaning and Body Awareness. Your teaching can be easy, more pleasurable, and full of body-mind treasures with Embodiment in Education in your toolkit! Dr. Martha Eddy, CMA, Ed.D. As educators, how can we bring somatic movement approaches into education in a way that is valuable and meaningful to students themselves? Drawing on the vast field of somatics, we can first expand and support the fullness of our own embodied experience. This provides the basis from which we learn to facilitate this process effectively for our students in order to support them in their process of growth and learning. This workshop draws upon several somatic modalities from Susan’s vast experience with somatics: including Experiential Anatomy/ Kinesiology, Body-Mind Centering®, Ideokinesis and Bartenieff FundamentalsTM. 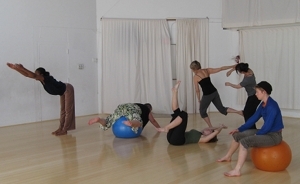 By integrating the methods of various somatic modalities, workshop participants experience multiple perspectives on movement re-patterning and methods of embodiment. Each modality offers different tools for developing greater kinesthetic intelligence and for further integrating body and mind. Classes are rooted in experiential activities to provide opportunities for you to learn about your own habitual movement patterns and how they may cause pain or restrict your full range of motion. You will learn how to change maladaptive patterns within your own bodymind and experience new, more integrated movement first – so that you can support others with a depth of knowledge that is rooted in embodied knowing. Essential to this process, you will also begin to examine the various socio-cultural factors that may have influenced your body, your movement, your experience, and/or your particular choices of movement / dance forms. Developing a heightened awareness of our own cultural conditioning is essential in gaining the compassion and insight needed to help facilitate discussions about such topics with teens and young adults. As educators, it is also essential to understand the particular needs of the various age groups and populations with whom we are working. Toward this goal, each experiential course will include discussions about pedagogy as a means to address the application of particular experiential activities with specific age groups / populations. Discussions will include faculty input, participant / group input, and time for questions and answers. Finally, when focusing on education involving touch and movement, complex socio-political, gender, and other such issues may arise. How can we include touch and movement in a safe and supportive manner? How can we discuss somatic-based approaches with other educators and administrators? How can we advocate for our embodied approaches within various educational contexts? We will address these complex issues together to support the integration of our work in the workshop with that of our professional lives. We include group process circles as a way to foster group cohesion and assure that emotion, spirit and critical thinking are nurtured in individuals and as a collective body. Order a copy of Susan’s new book, The Embodied Teen based on her curriculum. See Experiential Anatomy for related material. Join our Mailing List to receive notification of upcoming workshops and related events.